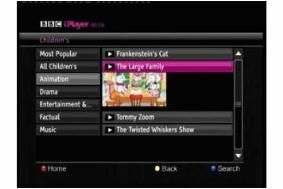 BBC iPlayer and ITV Player coming to Freesat | What Hi-Fi? Although the BBC now says it won't officially release the code for the BBC iPlayer on Freesat until after Christmas, we've been told the code 5483 should work. Owners of Humax Freesat HD or Humax Freesat+ set-top boxes will be able try out the beta version of BBC iPlayer on Freesat next week. Watch this video to find out how to access the service. Owners of non-Humax Freesat equipment will be able to access BBC iPlayer in the New Year. More information on the BBC iPlayer/Freesat trial here. A Beta version of BBC iPlayer will be available on Freesat from the 7th December, offering the BBC catch-up TV service on a non-subscription TV service for the first time. And Freesat has confirmed that ITV Player will launch on the Freesat platform during the first half of 2010. During the initial stage of Beta development of the BBC iPlayer, selected journalists and partners will be able to access the service using a code but Freesat hopes "as many viewers as possible will be able to use the service by Christmas". In the run up to Christmas around 450 hours of programming will be available each week, including popular programmes such as Strictly Come Dancing, Top Gear, EastEnders, Life, Gavin and Stacey, and The Gruffalo. "All existing Freesat HD television equipment will be able to receive the BBC iPlayer service, so consumers will not need to buy a new set-top box or TV," says Freesat. You'll need to connect your Freesat TV or box to your broadband connection using an Ethernet cable, and Freesat says viewers will need an actual broadband speed of 1Mbps to watch or 2Mbps to watch in high quality. Initially the Beta service will be available by pushing the red button and accessing the BBCi service. BBC iPlayer joins over 140 channels on the Freesat service alongside HD from the BBC and ITV, though you will need the dish installed and a tuner.